I found this recipe on the Internet today and was determined to make it. The first attempt was tasty but didn't quite turn out with the right consistency...my fault because I under cooked it. The recipe also called for the baking dish to be lined with parchment paper...I didn't have any so I used wax paper...big mistake because the brownie was completely stuck to the paper despite the liberal coating of cooking spray I applied. Also on my first attempt I did not use enough red food coloring so my red velvet brownie was more of a brown velvet ...not the right color. No worries...my kiddies will gladly scarf down my "oops" brownies. Luckily for me I had more of the ingredients needed to create this wonderful treat so I made a second attempt and I AM SO HAPPY I DID!!! These are really wonderful because they are not too sweet like your regular brownies can be. They have a bit of elegance about them...must be the Red Velvet! Preheat oven to 350 degrees and prepare and 8 X 8 baking dish by spraying it generously with cooking spray. In microwave soften butter is microwave safe dish and set aside. Do the same with the chocolate and then whisk the two together and let cool slightly. In separate bowl, mix together the 2 eggs, sugar, vanilla and red food coloring until well blended. Slowly add the chocolate mixture and blend well again. Sift together the flour, cocoa powder and salt and slowly add to the batter, being careful not to over mix. Pour batter into prepared dish and set aside. To make the cream cheese layer mix all ingredients together until smooth. 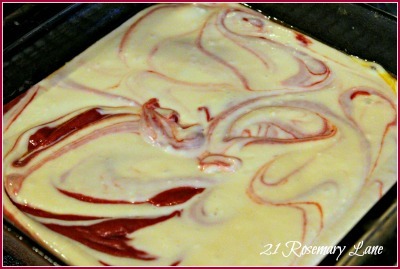 Pour over the red velvet mixture and with a butter knife swirl the two together. Bake in oven for one hour and ten minutes, remove from oven and let cool completely before cutting. I love Red Velvet anything!! Copied this...Thanks so much, Barbara! Yummy, Barb! Perfect for Valentines day!!! Wonderful that these are a little more chic than regular brownies! YUMMY! Hello from a new reader and follower. This recipe looks and sounds heavenly. Yum! Your post reminds me that I'm out of parchment paper too, need to put that on my shopping list. 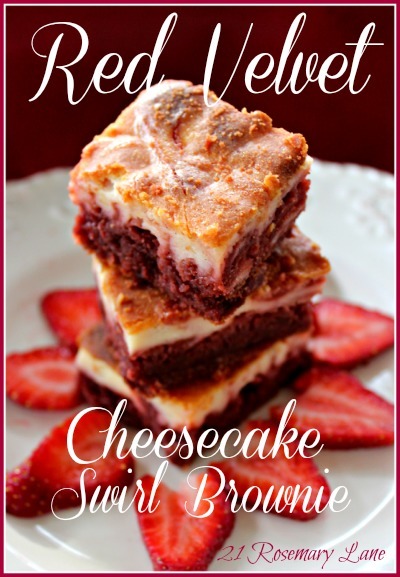 Lovely blog you have and that red velvet cheesecake looks delicious! They are so so pretty... and I bet those oops tasted delicious! You are my kind of girl. I just wish I would have been there to help you out... eating not making the second batch! Thanks for joining ON THE MENU MONDAY! Oh yum! These look divine :) Your blog is just wonderful! Wow! That looks amazing! Thanks for sharing! 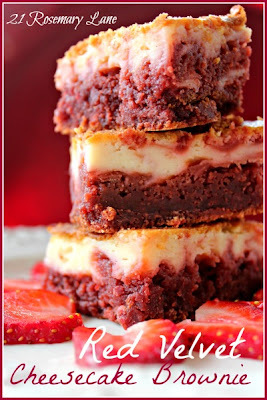 These cheesecake brownies look and sound absolutely amazing! What a great dessert! Oh my gosh. Just the name has me salivating. LOL. Thanks for sharing. Hi Barbara, These look delicious and would be great for a Valentines treat. Take a look at this weeks Open House party to see your recipe featured.